•Are you trying a new brand or new flavour of dog food? Abrupt changes can lead to vomiting or diarrhoea, so switch foods by weaning gradually over the course of a week. 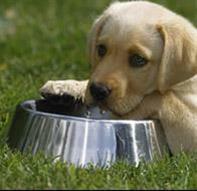 •Can your dog eat uninterrupted? Check that they can eat on their own without being disturbed..